S3‘ managed just an average opening at the Box Office. It’s should have done lot better if not for the frequent postponements of release date & political crisis in Tamil Nadu. In the Telugu States, ‘S3’ had a good start. This high-voltage cop drama collected a Gross of Rs 4.8 crore and Share of Rs 3.39 crore on Day 1. Especially, Masses have been appreciating Suriya’s roaring performance and the racy screenplay of Director Hari. Overall, A Share of Rs 90 crore should be collected for break-even. 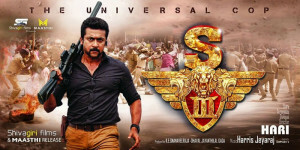 Not so promising start by make ‘S3’ Suriya’s fourth consecutive flop after ‘Singham 2’.